For 2014, we decided to go straight to the source and provide tangible aid that benefits Latin America directly. 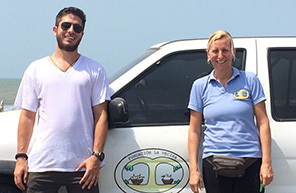 We chose the La Vecina Foundation, in Cartagena, Colombia. 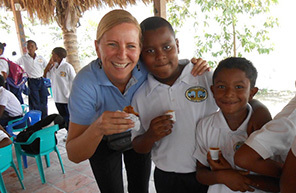 After spending a few days visiting the La Vecina school and talking with the founder, Nathalie Rietman, there was no doubt in our minds it would become next main charity. This year, each team is required to raise a minimum of $500 for the La Vecina Foundation. Anything you raise over that amount can be used for the charity of your own choosing or given to La Vecina. To help you raise the money, we suggest using GoFundMe or crowdrise as your fund-raising platform. You can then donate directly the money raised to La Vecina through PayPal or on their website. Fundación La Vecina helps underprivileged children in the Colombian city of Cartagena, providing them with education and support so that they will have a better future. The foundation was started on September 28, 2006. It is located La Boquilla, one of the poorest neighborhoods in Cartagena, with rented premises and Colombian employees. It works closely with local authorities and institutions, organizing and providing space for events and medical campaigns. The main goals are to provide the children with education, medical care, food, recreational activities and psychological support. 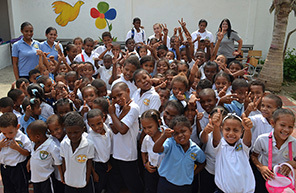 Together with its Dutch sister organization, it also raises awareness in the Netherlands, generating support for the issues and problems of disadvantaged children in Cartagena. The Carbonfund.org Foundation retires certified carbon offsets on behalf of its donors and provides greenhouse gas reduction options to individuals, businesses, and organizations. The Rainforest Foundation US helps to conserve rain forests in Central and South America by supporting indigenous peoples to protect and defend their ancestral lands.